TPU TOUCH SCREEN: High sensitivity TPU touch screen, support all touch operation on your phone with bag on. REFLECTIVE DESIGN: Reflective design is warning and clear in low visibility. The reflection element highly increases the safety of night riding. WATERPROOF: Waterproof material,the bag made by TPU material, Polyester, composite carbon leather, do not worry about the rain day again. 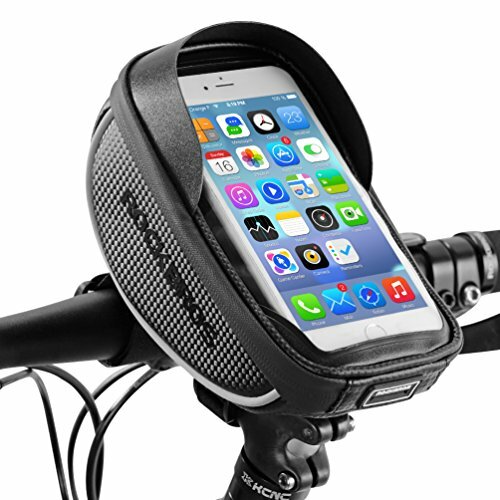 EASY TO INSTALL AND USE: Velcro strap design make this bike phone bag can be install and release quickly by hands, No tools required! Suitable for a variety of bicycles. MULTIFUNCTION: The bike phone bag can hold a lot necessary cycling tools, such as cellphone, keys, power bank, data wire and so on. HEADPHONE JACK DESIGN: There is a headphone jack at the bottom of the phone bag, you can use your headphone, also you can use the power bank in case of the low battery. If you have any questions about this product by RockBros, contact us by completing and submitting the form below. If you are looking for a specif part number, please include it with your message.